One of men's best characterics is persistence. When a man is determined to find something that can make his life more meaningful, he will stop at nothing to get what he wants. That is persistence! We are lucky that most of the scientists of our time are persistent in studying and looking for cures to all of men's ailments. In the issue of journal neuron, Yale University researchers have found that a single molecule not only connects brain cells but also changes how we learn. They discovered ways on how to improve the memory and new therapies to correct neurological disorders. "The junctions between brain cells over which nerve pulses pass -- called synapses -- are crucial for regulating learning and memory and how we think. Aberrations in the structure and function of synapses have been linked to mental retardation and autism, while synapses are lost in the aging brains of Alzheimer's patients." The Yale scientist may have discovered the effects of the synapses but organizing is still a puzzle that needs to be solved. A molecule called SynCAM 1 that spans across synaptic junctions has been pinpointed as a critical piece to the puzzle. "We hypothesized that this molecule might promote new synapses in the developing brain, but were surprised that it also impacts the maintenance and function of these structures," said Thomas Biederer, associate professor of molecular biophysics and biochemistry and senior author of the study. "We can now define how this molecule supports the brain's ability to wire itself." The Yale team who focused on an adhesion molecule called SynCAM1 found that when the SynCAM 1 gene was activated in mice, more synaptic connections formed. Mice without the molecule produced fewer synapses. 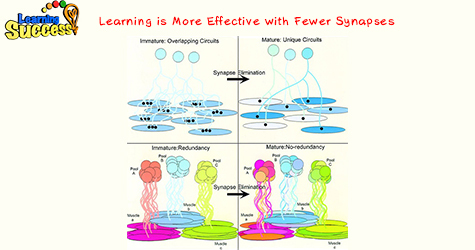 Although, they also discovered that when there is high amounts of SynCAM1 does not help in learning while those mice that have no SynCAM1, learn to a greater degree. This just shows how unpredictable the brain works. But no matter how difficult the situation maybe, there will always be a solution.